Fool your friends. Plastic and metal. 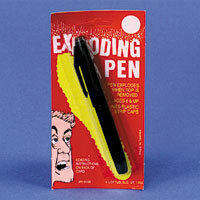 5 inch exploding pen. (requires caps, not included). $12.00 per dozen for 10 dozen or more. $10.35 per dozen for 20 dozen or more.